Back in 1989, I had little awareness of Stephen Covey’s now seminal business classic, ‘The 7 Habits of Highly Effective People’. Frankly, my focus was on enjoying my first year at University, secure in the knowledge that the scary world of work was at least two years away, if only I could survive all those forthcoming Geography exams, still fermenting pints of Scrumpy and vast 20” pizzas at ‘The Waterfront’. Plus, I wasn’t reading business, so Mr Covey’s work on personal effectiveness was orbiting on a very different plane to that of glacier behaviour or coastal geomorphology. Yet the irony for someone studying, amongst other things, rocks, was that an understanding of ‘Big Rocks’ would have been incredibly useful. The metaphor is a simple one – which is its power of course. A jar represents a finite resource – time. Sand is the myriad of little tasks that you could do, teasingly appealing, but which frankly will have few consequences if you put them off because they are so inconsequential. Most of your E mails, phone calls, frogs croaking every time you receive a text, you know the drill – sit in this category. Pebbles are more meaningful tasks; tasks which have a manageable impact if you decide to ignore them or not manage them. 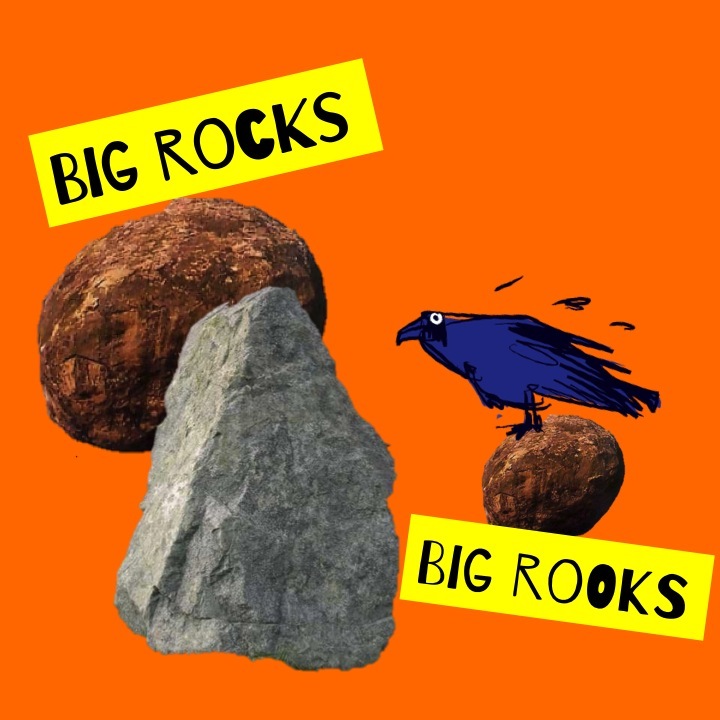 Finally, there are the Big Rocks: the important things in your life (work and play), which if not dealt with will have big consequences, and potentially negative consequences too. In life, we tend to deal with the grains of sand first for a whole variety of reasons: ease, speed of completion, desire. Then the pebbles because, well, it’s easier to get your hands around them and you might be able to knock some of them on the head, quickly, giving a vain feeling of achievement. Too often the Big Rocks, the challenges, the knotty problems, the priorities that we have procrastinated around, we leave until later. In Covey’s metaphor, if you do this, you run out of jar (time). The trick? Deal with the Big Rocks first. If you do, then you’ll find that the pebbles and sand all fit around the priorities and into the jar. I was mulling on Big Rocks again this week as I pondered the task that Dave Lewis, Tesco’s incoming CEO, has on his plate. Goodness: I’d love to earn his paycheque but I wouldn’t like his task list and all the pressures from every angle to turnaround performance. Yet ultimately it does boil down to Big Rocks principles: deliver excellent customer service; sharpen prices; innovate in the right places; improve store experience; continue to roll out the Tesco footprint into new markets. Whatever his right list is, it can’t afford to be very long. The interesting thing is that Covey’s work applied to people: highly effective people in his terminology. But it should apply to brands just as much. People of course, power brands. The two are inextricably linked. Both need to practise sacrifice to be effective. Both need to focus on the Big Rocks first and resist the temptation to play on the beach with the sand and pebbles. Both need constant reminders that time is a limited resource and you can only achieve so much. This hit home last week, working with a client on brand training and attempting to impress upon them the importance of doing just a few things with real scale. It’s not enough just to say ‘Let’s focus on the Big Rocks!’; it isn’t an end destination. It’s a daily battle, walking a line and noticing when the sand and pebbles are pulling you in. It will be interesting to see how easy or difficult they find it to retain the clarity we finished with as other voices in their business call for a different set of priorities. And it will be interesting to see how Dave Lewis at Tesco manages to set and retain a tight agenda too. David Preston is founder of The Crow Flies, a research, strategy and innovation company that helps brands find a direct route to long lasting success. david@thecrowflies.co.uk; +44 (0) 7885 408367; www.thecrowflies.co.uk; @crowflieshigh.